Even before Trump was elected it was already clear that no one should expect him to cut spending and rein in annual budget deficits. Trump has always been about buying votes with more and more spending. Moreover, there is no evidence that Republicans are any more fiscally restrained than Democrats when in control of the federal government. After all, when the Republicans controlled both the White House and all of Congress, from 2003 to 2007, government spending grew at one of the fastest rates in decades. With the end of fiscal year 2018, and with Trump's support for a historically large spending hike for defense-related departments, we're getting a sense of Trump's fondness for spending as president. While true that, so far, Trump doesn't represent a sizable departure from the spending trends of the previous administration, he nevertheless is confirming for us that budget cutting is not part of his agenda. 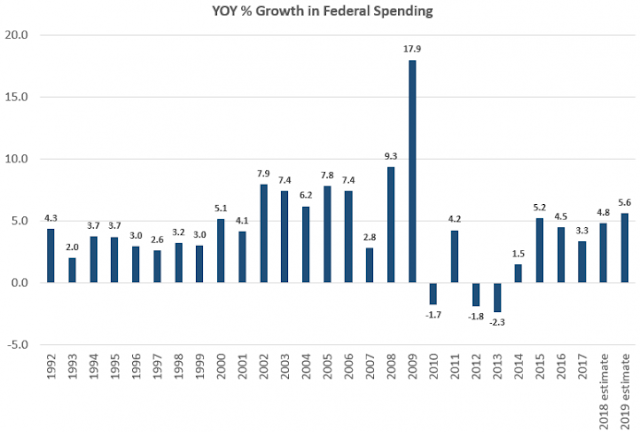 Moreover, the spending increases we're seeing now are coming in a boom period. As the huge spending increase of 2009 has shown — spending that can be blamed on both Bush and Obama — we should expect big spending increases in times of recession. 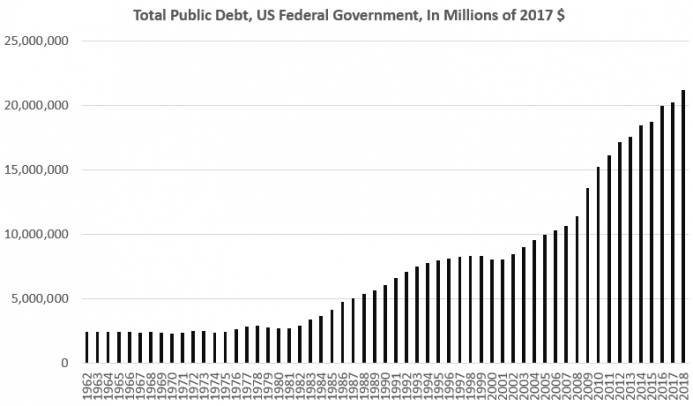 Fiscal year 2018 ended last month, and during that period, the US government added more than a trillion dollars to the national debt. As of October 1, 2018, the first day of the 2019 fiscal year, the Federal government's debt outstanding totaled $21,606,948,383,546.28. On year earlier, the total was $20,244,900,016,053.51. 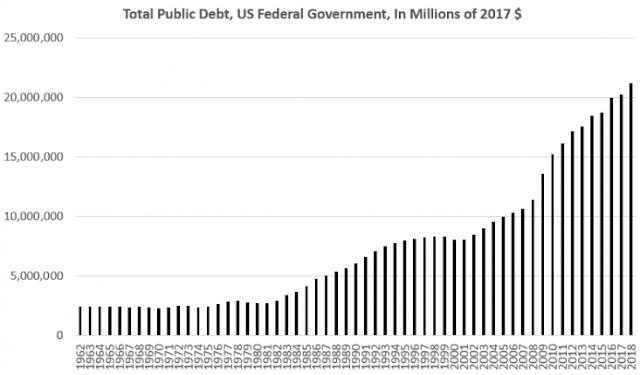 At 21 trillion dollars, the US national debt is, of course, at the highest level it's ever been. Not surprisingly, given generally stable federal receipts, debt is being driven by federal spending which is continuing at a rapid pace. 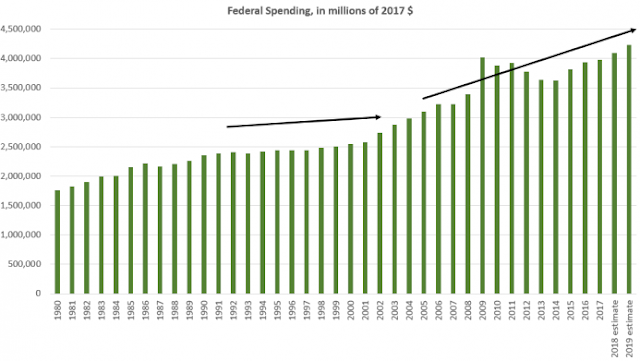 In the 2018 fiscal year, the OMB estimates federal spending topped $4.17 trillion, which is an increase of 4.8 percent over fiscal year 2017. That's the second-highest growth rate in the past five years, and the third highest in the past decade. 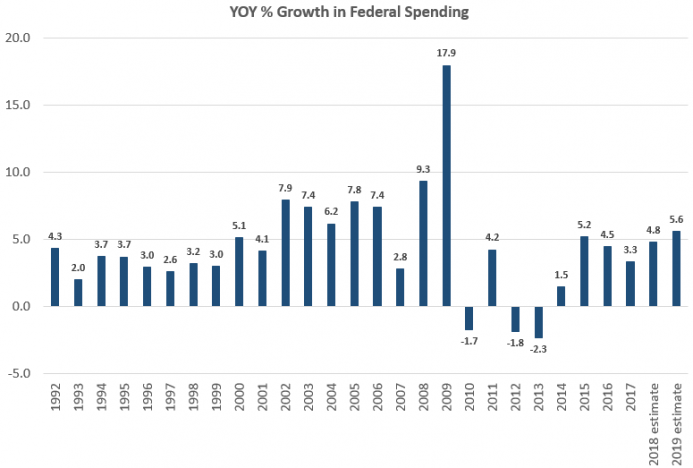 2018's spending growth rate also was larger than the growth rate recorded for seven out of eight budgets signed by Democrat Bill Clinton. If the OMB's estimates for 2019 turn out to be true, spending growth will hit a ten-year high of 5.6 percent in 2019. None of the biggest spending programs — those that contribute the most to federal spending — have seen cuts. Last week, Trump signed into law a very large increase in defense spending. 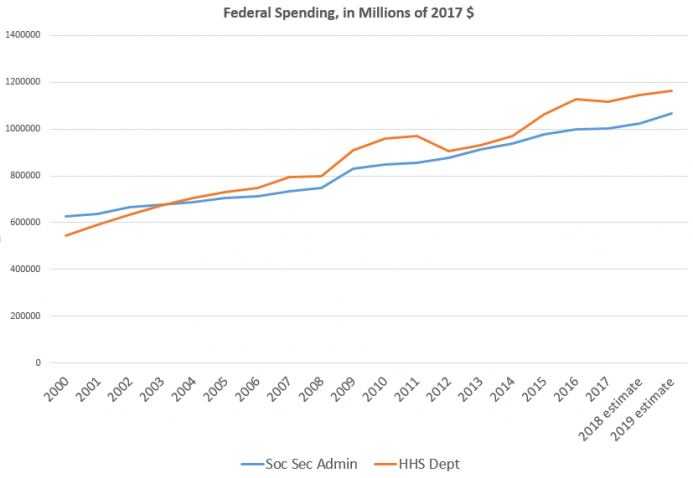 Moreover, the major departments for welfare programs continues to see increases. And while we're likely to hear about how welfare programs are suffering "cuts" under the Trump administration, the truth is these departments are likely to see increases through the 2019 fiscal year. Neither Social Security nor the Health and Human Services department are facing cuts. In the short term, of course, this is a winning political strategy for Trump. Both military and welfare programs continue to be generally popular among Americans, and there is little widespread political will for cuts. The seriousness of the situation is unlikely to come to the fore until recessionary pressures for more "stimulus" push spending to newly unprecedented levels, as happened in 2009. This in turn will lead to enormous deficits which will in turn require more borrowing. That may put upward pressure on interest rates. If that occurs, payments on the national debt will increase, eating up larger and larger parts of the federal budget. Only then — when sizable amounts of government funds must be moved out of welfare programs and military programs and into debt payments — will the seriousness of the debt become apparent. Until then, it looks like Washington is happy to ignore the problem.